Here's your panorama of Soper's Hole, West End, a favorite stop of ours last year. 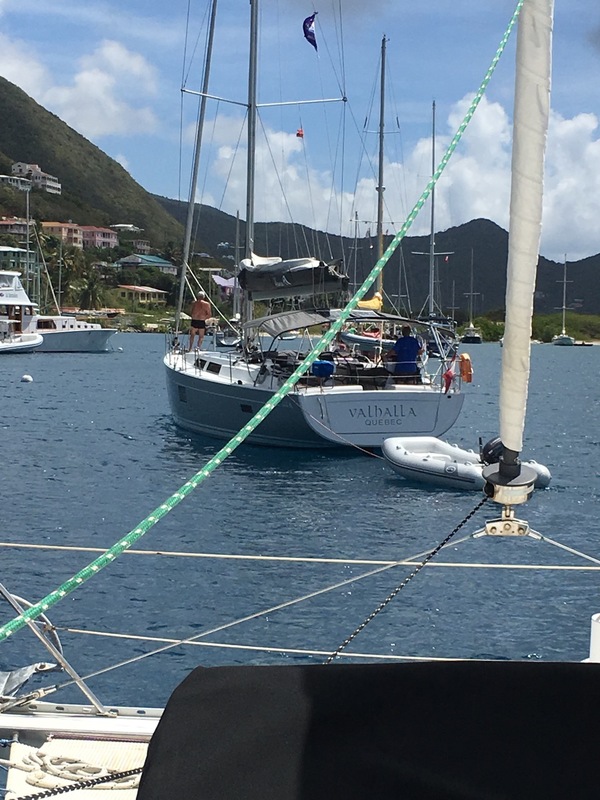 Last year, we passed through the British Virgin Islands quickly, while making a run for Virgin Gorda and a weather window to Sint Maarten (see blog "USVI & BVI", May 2016). This year, I had done more research on where we could avoid paying for the mooring balls which fill most of the popular anchorages (see Zero to Cruising's blog post, "Yes, You can Anchor" zerotocruising.com/yes-you-can-anchor). 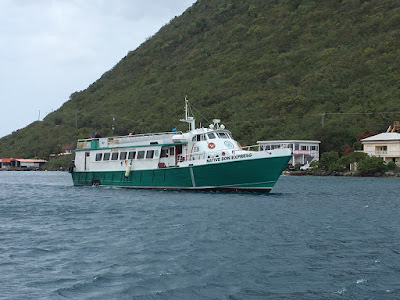 We anticipated spending a month exploring (Customs only gives you 30 days or you have to pay to $200 to import the boat). However, after a poor decision to hit the main harbor in Jost to visit Foxy's, we remembered the problem with the BVI's. They're beautiful. Idyllic. Some of the best cruising ground in the world, we're told. You'll see boats here you've never seen anywhere else. It's a rush to see so many boats sailing in every which direction through the channel. 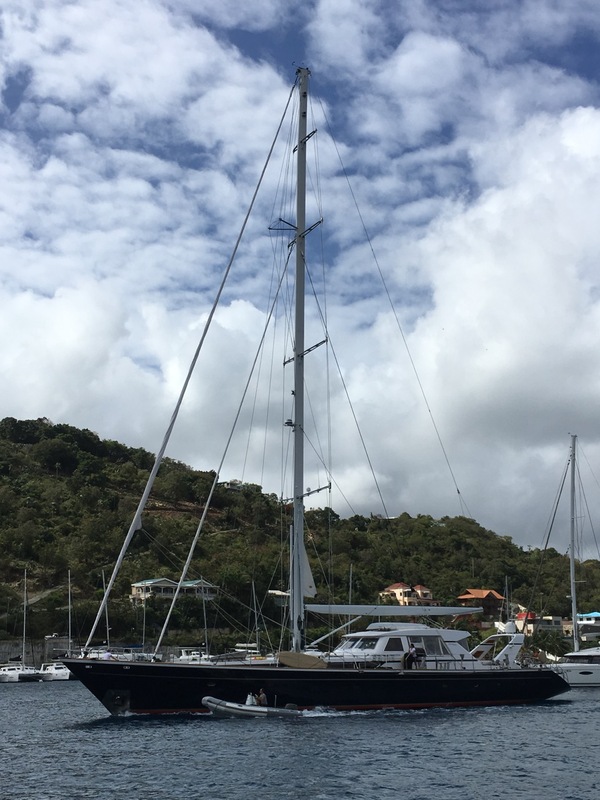 Unique and VERY popular with bareboat charterers. 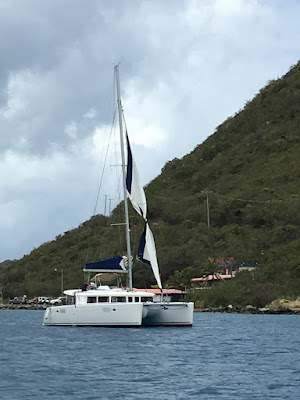 Since we like a little quiet to go with our nature, the BVI is not our happy place. The Captain decided to bolt before I could coax him into a couple more stops. The north swell didn't help. 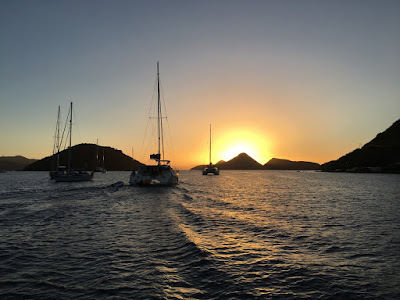 West End/Soper's Hole, Tortola: Instead of continuing around St. John, we're going to Soper's for groceries, cause we're spoiled (Harbour Market is awesome)! Although we're trying to hit places we missed, it's so much less stressful to pull into a familiar port. 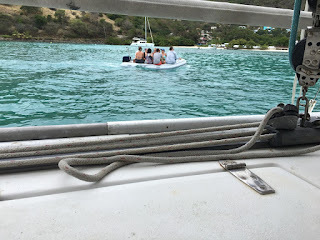 We find a ball on the first pass through ($30/night) and after we get over the initial shock, there is plenty of entertainment from the bareboat charters (Hey guys, it's OK to wave to other boaters, by the way. Another reason I'm not convinced they are having as much fun as we are). Summary: Total time 0:32, avg speed 3.9 kts, total mileage 2.1 nm, 2-engine motor. Soper's has no lack of "harbor tv". I apologize to any of our followers who have bare-boated, but we see some crazy $hit over here! Don't be this guy. New rules say all passengers must report to the Customs office. However, we are hearing just the Captain is fine (it's a very small office). We paid a total of $23.25 for 7 days (supposedly, based on tonnage) but last year we paid $35.50? Fellow cruisers seemed confused also. From now on, we'll always answer "just staying a few days" since the agents may also be charging you by the day (pure speculation). If you answer "yes" to the National Parks (ie. 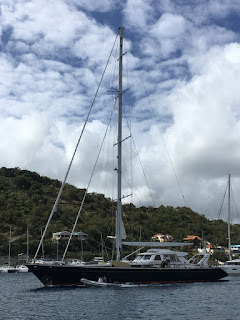 mooring balls at the Baths & the Rhone http://www.bvimarineguide.com/programs.html) then that is extra. One of the Pusser's. Yes, you must visit at least once. I was Pusser's fan but I've fallen for Brugal. 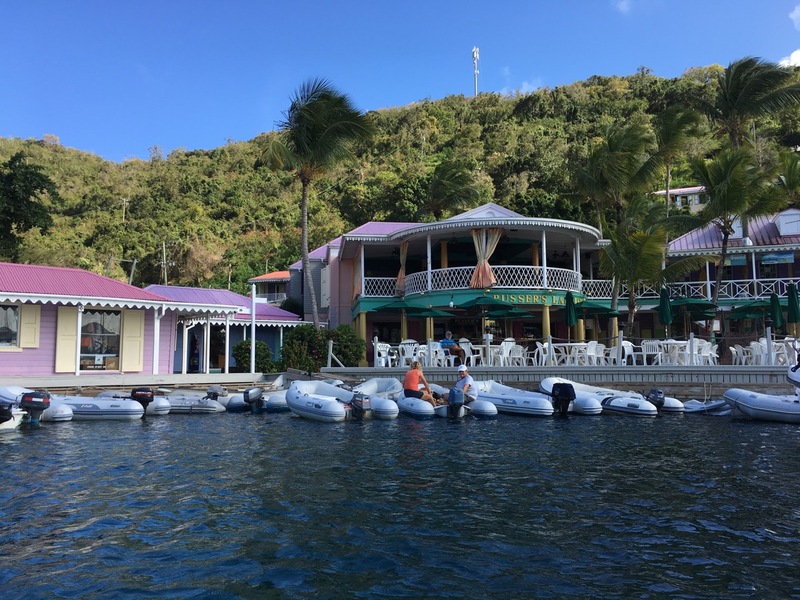 If you've already been to Pusser's, then I recommend The Fish & Lime, just west of customs (may need a stern anchor for the dinghy, because of ferry wake). No wifi. "You're going to have to talk to each other." Great views & a nice breeze. Gluten-free options available--I recommend the fresh grilled fish tacos. And no mosquitos by order of the Queen! I can usually take the good with the bad, because cruising has taken us to some amazing places. 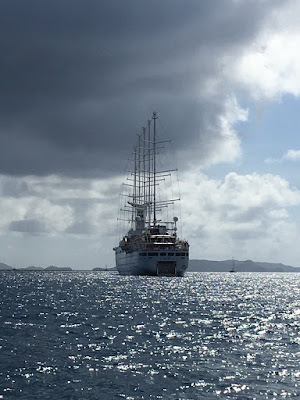 However, climbing across dinghies to get to yours, which is three-deep, with groceries, and it starts to rain...that's a "pass" on my fun meter. On our last evening before departing, the water went suddenly calm. I threw the SUP in the water to explore a creek I read about on Three Sheets Sailing's blog. 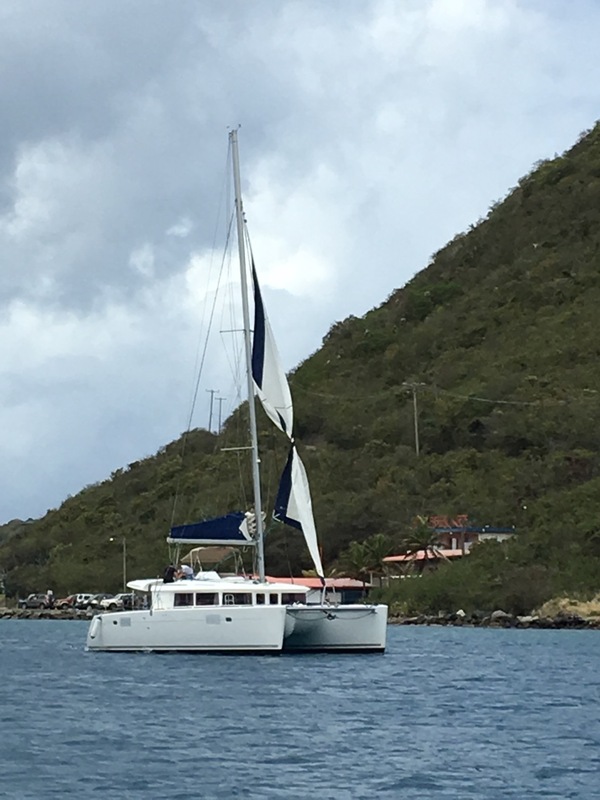 According to our nautical charts, there is nothing there but Jennifer says there is enough water to get under a small bridge and through to the bay on the other side. I follow a local in a small powerboat back to his mooring. Dodge some sailors from the marina racing rc boats. I meet two kids who caught their first fish. "Do you want to come look at it?" and confirmed that it is WINDY with whitecaps on the other side. I made it back just before sunset. 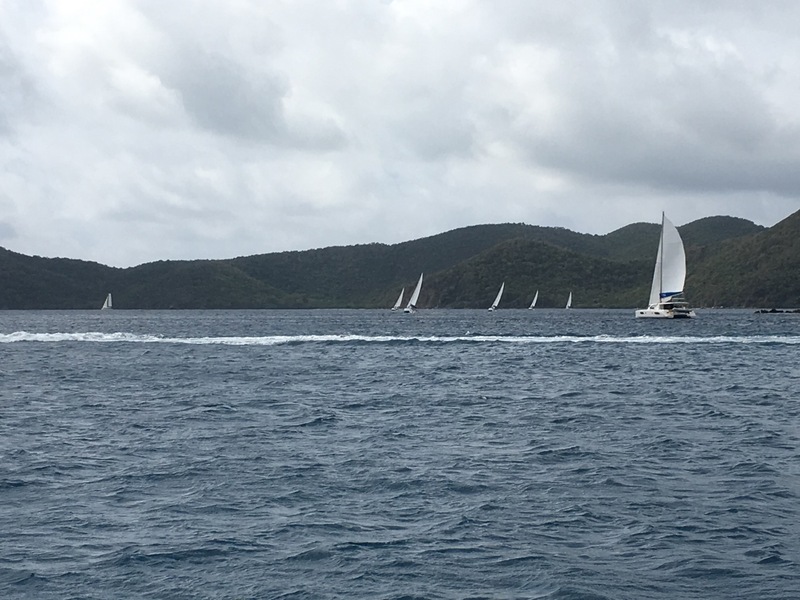 The fleet headed south through Thatch Island Cut for Sir Francis Drake channel. Love all the sails! We're dropping off our mooring ball by 9:30 am (after a PANICKED attempt to post a blog with sketchy internet before the laptop battery dies). We unfurl the genoa and ride a SE wind most of the way across except for dodging charter boats ("Ever heard of right-away rules? No? I didn't think so". It's why The Captain doesn't let me talk on the radio). 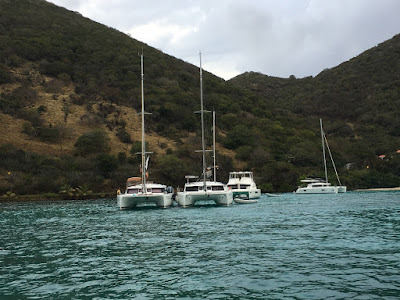 We arrive at Great Harbour, Jost Van Dyke, BVI by 10:30 am and have our pic of mooring balls. By noon the balls are full (but people are still arriving at sunset and there are a few panicked radio calls. "Any room at White Bay?!!! Hello?!!!"). According to our guidebook, "Jost Van Dyke is less than 4 miles long and just over a mile wide with hillsides that rise to a height of 320 feet. 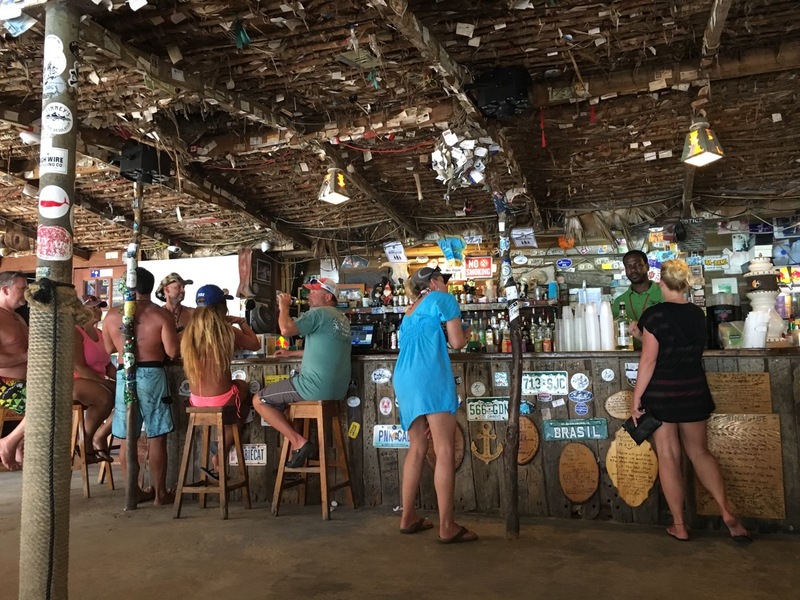 Most of the population of around 200 live on the south side of the island serving the businesses for visiting boaters." 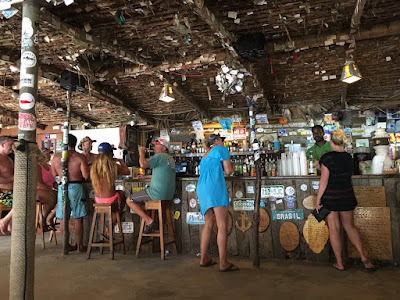 Stepping out of the dinghy, onto the dock, then the sand & into Foxy's Bar & Restaurant--no shoes necessary. And yes, I was overdressed because I threw clothes on over my bathing suit! Foxy's is much like the movie, Titanic. By the time you get there, the expectations exceed the reality. Check. We've BEEN there! (Even the t-shirts were too expensive. Next). If we were to come back we'd try Corsairs, Soggy Dollar in White Bay (cab or dinghy ride), or Foxy's Taboo and the bubbly pool. When it gets too crowded they raft up--except there are two boats (and a reef) right behind them! If you aren't sure they are bare-boaters, the overloaded dinghy gives them away. No cruiser would try to put eight people in one underpowered dinghy! It's a ESE wind with a north swell. Try picking an anchorage or going sailing in that! Rainy day. 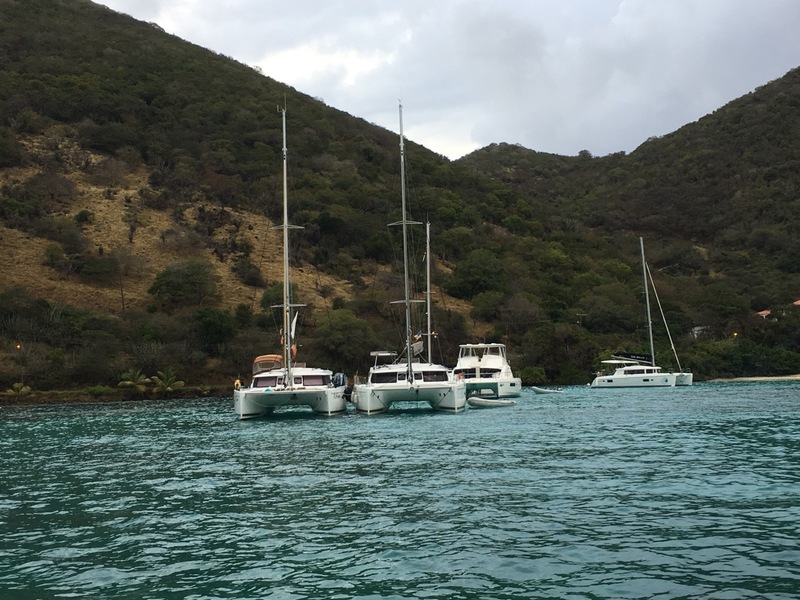 Stayed inside & stayed put in Jost. It starts to rain, WHILE I'm opening hatches. Out of sheer boredom, I took the dinghy in to explore. Rudy's grocery has their own dock (nothing exciting), bakery (bought some local coconut bread for The Captain. He wasn't impressed). If we hadn't stopped in Soper's, there is a marina with a dock and a sign for "snacks water, ice, gas". Anchoring notes: The Scott's Cruising Guide recommends the east side, just off the reef (south winds). See Zero to Cruising's link above--see pictures (our chart plotter showed that as reef but at least 4 boats spent the night there). Soper's Hole/West Bay, Tortola: Still a north swell. No Cane Garden Bay for us. Back to Soper's for laundry, water, groceries, and to clear out. On our first pass through, there are no mooring balls available. 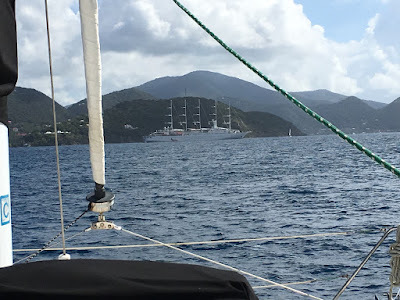 We circle and watch a sailboat run over their mooring & wrap it around the keel (That's bad. Someone came over in their dinghy to help). It's all less comical when you are still navigating through the field. We finally found a ball in the front corner, which we thought was mostly occupied by permanent residents. It's VERY close to other boats and after I wiggled us in, I wasn't sure I could wiggle us back out. I order the Captain to stay while & I go do laundry. Upon my return, a ball opens up and & we (successfully) move. No boats damaged. No one went for a swim. Flow cellular is back! Happy girl. Summary: Total time 1:19, avg speed 4.4 kts, total mileage 5.7 nm, two-engine motor. Wifi: We had Flow Cellular through T-Mobile in Leinster (unlimited 2G but it was 3G, not quite tethering) but it went away in Sopers (turn phone off & on or take phone to Harbour Market & it may reset. Leave it in cockpit). 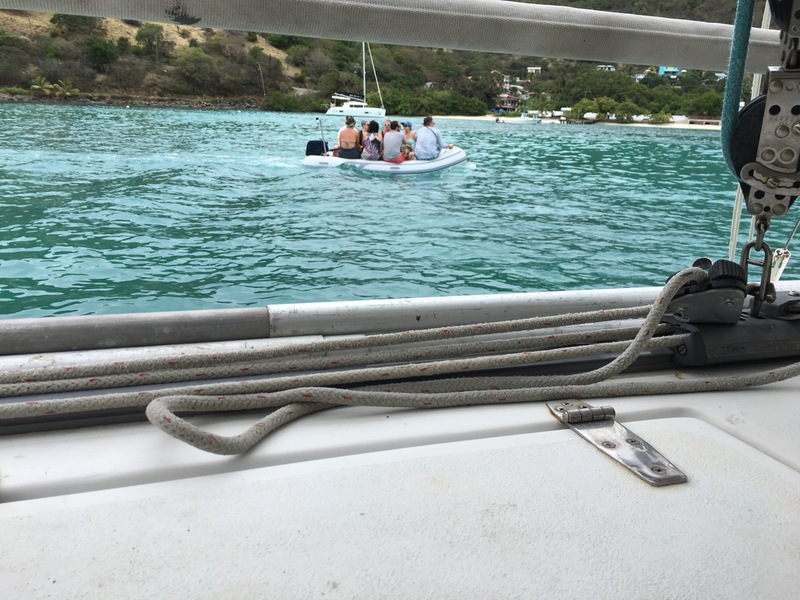 AT&T was also working (signal from Red Hook, USVI. Turn off roaming). Trash: there used to be a dumpster by customs dinghy dock but it was gone. They didn't charge us with water/fuel purchase as Soper's Marina. 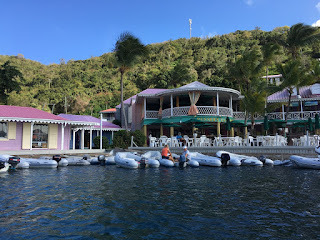 Grocery: Harbour Market is just left of Pusser's (as you come up to the dock). It's the cheapest liquor we've seen (Try the Bombay Sapphire East for $16). Don't forget to go upstairs. 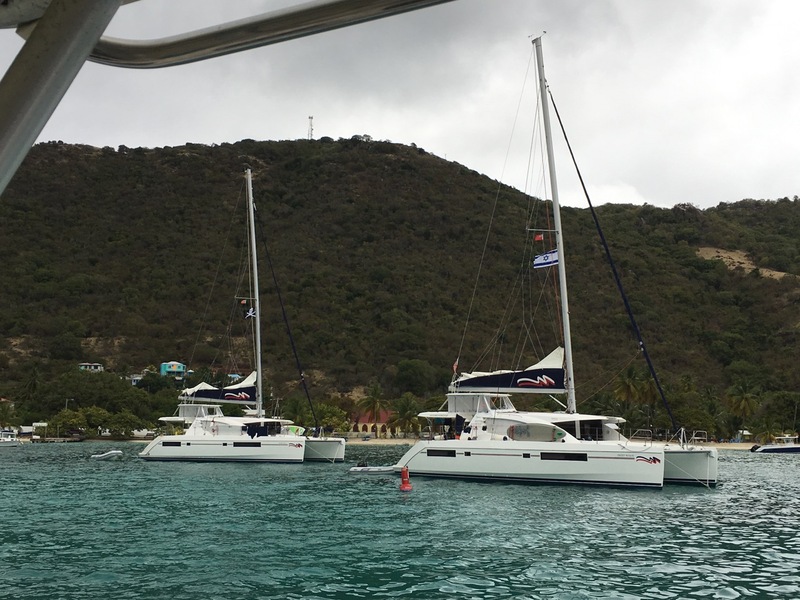 We're off to Hansen Bay (in Round Bay in Coral Bay--one of the more confusing conversations we have with fellow cruisers), St John, USVI next! I was really want to get some more detail and information about the Activities but your blog helped me so much thank you for sharing it.